Chris Powell and Shawn Herdman cut the ribbon on the memorial bridge in Goshen Memorial Park. 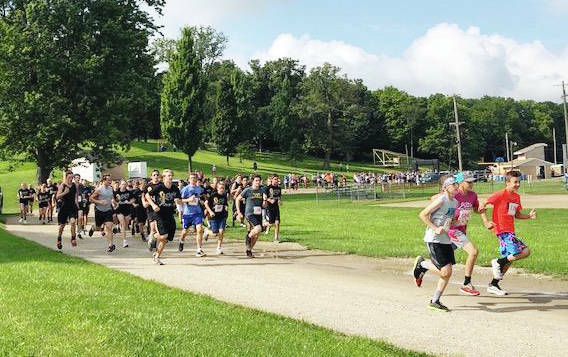 The annual Running4Life Fearless 5K race was held Saturday in Goshen Memorial Park. From left: Morgan Powell, Betsy Dunlap, Chris Powell, Landree Powell and (in front) Everly Powell stand with the monument dedicated to Mayci Powell in Goshen Memorial Park. MECHANICSBURG – Goshen Memorial Park was alive with the spirit of altruism Saturday morning. 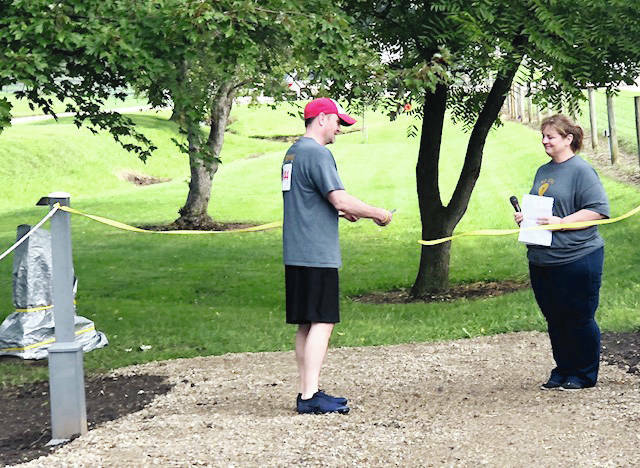 The sixth annual Fearless 5K was held and a memorial bridge and marker stone dedicated to Mayci Powell – a Mechanicsburg 20-year-old who lost her battle with cancer in March – were unveiled and dedicated. Running4Life, the 501(c)(3) non-profit that organized in 2013, spearheaded the event. Mayci’s family was attendance for the unveiling on Saturday. The bridge was made possible with a vision that started with Running4Life members and quickly became a community project with many volunteers and donations. The Running4Life mission is to help children and their families facing life-threatening illnesses. 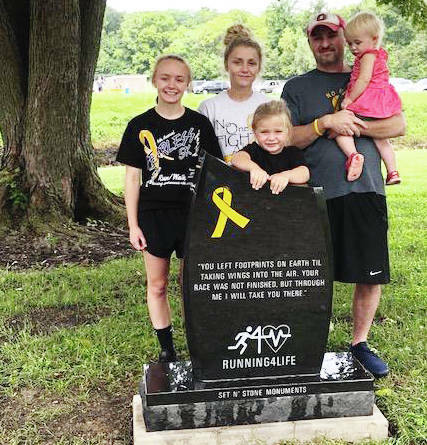 Originally created in honor of Ellie Herdman, a Mechanicsburg resident diagnosed with osteosarcoma at the age of 15, the project has garnered in excess of $100,000 for more than 25 local families dealing with expenses associated with such illnesses.